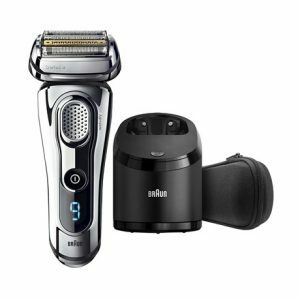 The Braun 9-9295CC is a member of Braun’s Series 9 family, which includes Braun’s three most expensive and modern electric shavers. This waterproof shaver boasts “40,000 cross-cutting actions per minute” and calls itself “the world’s most efficient razor”. It will cost you $325 if purchased directly from Braun and promises a lifespan of up to 7 years. Also known as the Series 9 Chrome, this shaver was clearly designed with the intent of being a top-of-the-line option. The other two products in Series 9 are very similar to the 9295-CC, except that they are silver rather than chrome. One can be purchased with the same high-end accessories as Chrome. And the other version comes with only a travel case; rather than charging in a Clean and Charge Station, it is charged with a standard cord. The LED display on the Series 9 Chrome shows the user how much battery life the shaver has left, as well as its “hygiene status”. which will let you know when your shaver needs to be cleaned. Keep in mind that its charging station is also a cleaning station that will automatically clean, lubricate, and dry your shaver. Foil head shavers are an alternative to more traditional rotary shavers. The foil head on the 9295-CC is what allows for the precise shave that Braun is promising with the Series 9. The foil head also promises to be beneficial for sensitive skin, as the cutter moves side to side rather than in a circular motion, which helps to prevent irritation. It is recommended that you replace the foil head every 18 months. This shaver can be used wet or dry, meaning that you have the flexibility to decide whether or not you want to use shaving gel or cream on any given day. This is incredibly convenient, as you can shave dry when you’re in a hurry without having to worry about razor burn and irritated skin. It is certainly a benefit that the shaver is waterproof; Braun claims that the shaver will hold up to water as long as it is not submerged deeper than 5 meters (or 16.4 feet) underwater. That means that it is completely safe for you to rinse off your Series 9 in the sink, or even get your morning shave out of the way while you’re in the shower. Another feature of the 9295-CC is its precision trimmer, which is hidden away on the back of the shaver. This feature might be particularly beneficial for men with sideburns. The shaver will run for 50 minutes on a single charge, which is a decent feature. If you find that your battery is dead and you’re overdue for a shave, the 9295-CC’s quick-charge feature will allow you to get a full shave out of a 5-minute charge. This shaver gives a solid performance and has a lot of features that make it a great option for most men (assuming you aren’t completely put off by the hefty price tag). This is a shaver that does what it is supposed to do — make your morning shave convenient and efficient. You are guaranteed to get a good shave with the Series 9 Chrome. There’s no doubt about that. It’s got a quality foil head that allows for excellent precision and reduces the risk of skin irritation. And the hidden trimmer is a great feature that will allow you to continue using this product even as you mix up your facial hair style. There is no denying that the 9295-CC will give you a quick, precise, close shave with minimal effort. It is a reliable, high-tech product that will make your shave easy and enjoyable. This shaver is especially optimal for men who like to mix-up their morning shave. For example, if you’re someone who likes the convenience of a dry shave but sometimes prefers to use shaving cream, or maybe even occasionally wants to shave in the shower. Then the 9295-CC may very well be worth the money. Its LED display and convenient Clean and Charge Station allow you to use this shaver without daily upkeep. Simply put it in the station when the battery is low, and press the cleaning button when the display tells you to. That said, the Series 9 Chrome is a seriously pricey product, and there is a good chance that you will get an even better (or at least similar) shave with a less expensive electric shaver. That is not to say that the 9295-CC is going to leave you stubbly; it’s a fantastic high-end shaver! But it isn’t necessarily the best on the market, which is what I would expect from something that will cost you around $800 by the end of its life. The general consensus amongst users is that the shave they get with the 9295-CC is absolutely great, but it could be better. These accessories put it a step above many other electric shavers. The Clean and Charge Station is a convenient accessory that certainly beats having to mess around with a standard charging cord. The station claims to make cleaning simple, hygenic, and hands-free — but to be prepared to replace the cleaning cartridge a few times a year. A package of replacement cleaning cartridges for the Clean and Charge Station will run you $22 for a pack of four. Braun recommends that you replace the cleaning cartridge every three months, which means you’ll be paying $22 once a year. Of course, you could also choose to take advantage of the fact that this shaver is waterproof, and clean it yourself by rinsing it off in the sink. The manufacturer also recommends you replace the foil cutter head every 18 months. Although that isn’t terribly frequently. You may consider it a downside that the replacement block will run you $79.99. The part is called the “Braun 92S Replacement Head”, and is easily accessible on Braun’s website. Let’s calculate the overall cost to upkeep and maintain this electric shaver. The initial MSRP for the Series 9 Chrome and its parts are $324.99. If your shaver lasts the full 7 years that the manufacturer claims it will, you’ll be replacing the foil head 4 times for a total of $320.96. You’ll also be paying $22 a year for replacement cleaning cartridges, which will add up to $154 across the shaver’s lifetime. That comes out to a total of $799.95. 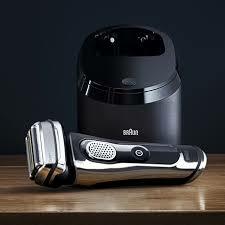 Many users of the Series 9 Chrome agree that they’ve gotten as good a shave using Braun’s Series 7 line. The highest-end shaver of the Series 7 line is the 7899-CC. 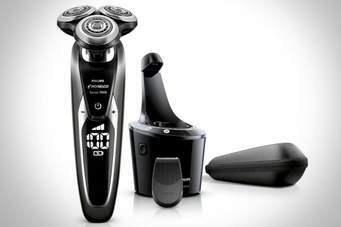 This electric shaver comes with very similar features to the Series 9, but will only run you $200. It also has a Clean and Charge Station, runs for 50 minutes on one charge, has a foil head, and can be used wet or dry. The only obvious differences are that the Series 7 is only water-resistant (not waterproof), and does not have an LED display. Another alternative you may want to consider is the Panasonic ES-LV95-S, also known as the Arc5. The Arc5 costs $160, and has many similarities to Braun’s 9 Series. It can be used wet and dry, comes with a cleaning and charging station, is used cordlessly, and promises a close, precise shaving using its five blade foil head. Let’s talk about the shaver’s charger and battery life. The 9295-CC comes with Braun’s convenient Clean and Charge Station. Place your shaver into the station when you’re not using it, and it’ll automatically charge. It takes one hour for the shaver’s Li-ion battery to charge completely. And that one charge will last for 50 minutes. You can also do a quick-charge in 5 minutes, which will be enough battery to get you through one shave. The manufacturer claims that the Series 9’s Li-ion battery life will not worsen over time (like we often see with other electronics). Meaning that the shaver will continue to last for 50 minutes on a one hour charge for as long as you have it. Since 50 minutes of use is quite a long time, you should be able to go on many business trips and vacations without having to worry about lugging your Clean and Charge Station along with you. That said, if you’re going on a longer trip and are going to need more than 50 minutes of shaving, the charging station is not the most convenient shape or size to take with you. A lower model of the Series 9 comes with a power cord (rather than Clean and Charge Station), but the cord does not seem to be readily available for purchase on Braun’s website.